Today is my birthday so was just taking it easy and not really thinking too hard about my photo. I was outside watching my son, whilst he rode his new scooter around and then suddenly saw the photo opportunity. I only had my iPhone with me, s not a bad shot for a phone. 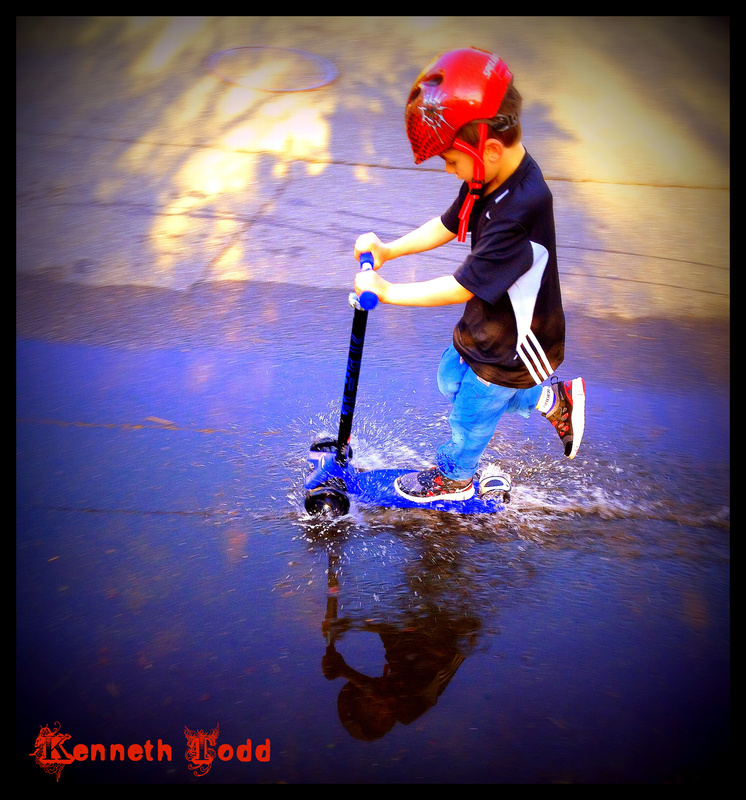 I just love the colors, the splash, the slight blur of motion, the reflection and his concentration. He is just in the moment, loving it, being stimulated by a “puddle of water”. We were all like that once and we should go back there from time time and not take ourselves and life so seriously. Enjoy your day. “In the heavens I see your eyes. This is fantastic! I love the joy we can see in kids at play – fortunately its contagious. You can tell you’ve caught it by the smile on your face. Thanks for sharing this and I look forward to looking around some more. Thanks Julz. Hope you stay around for awhile and enjoy the photos. Great shot, Kenneth and Happy Birthday. Thank you and glad you liked Rumi. This is a great shot, not only the cute subject but the reflections and lighting. Happy BDAY! I like this photo a lot, how you’ve captured your son’s boldness in command of his wheels, and the bold colors. Hope your day is weederful! Happy Birthday. What better way to celebrate your day! Can’t believe you captured this moment with your phone – wow! What Fun! – the image and the activity. Really fun shot! Happy birthday. What a great shot! And with an iPhone. WOW. Happy Birthday. This is one to enter into a contest! Winning would be your Birthday gift! Happy Birthday! A wonderful photo like this makes a great birthday present, no doubt! Love the catch.. Feels like doing this myself .. I mean splashing in the puddle of water .. Happy birthday to you .. Living life and having fun doing it! This little boy has the right idea.